I took the skatebike out on the weekend and tried riding at the local high school parking lot. There was too much slope for me and I found braking a challenge to control speeding up. I tended to either apply the coaster brake with too much force bringing it to a quick stop or when I reached for the hand brake it was harder to balance. There is some interesting discussion on the Max skate bike at skate and annoy. 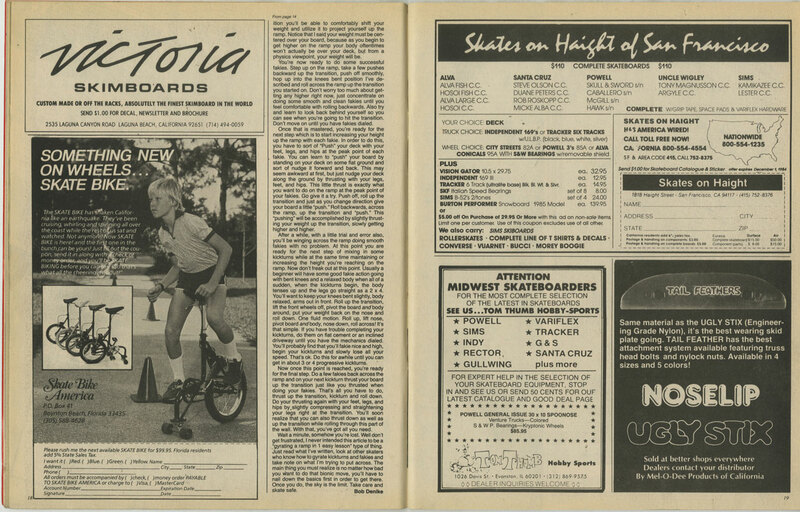 They pointed to the origin of the Skate Bike ad. It was printed in the Nov and Dec 1984 issues of Thrasher Skateboard Magazine. Now here is a Skate Bike from a different angle, more scooter like. I have been trying to figure out a good location to mount my GoPro camera on the skate bike. My original mount was on my helmet. As there are no reference objects in the field of view it gives a floating in space view. When I watched the GoPro video on using the bike frame mount most shots show enough of the bike to give a context to the shot. With a skate bike the problem is one of frame geometry. As the bike is basically vertical, you don’t see part of the bike. I even tried on the tubes going to the back wheel but then too much of the view was blocked. Also I do not want the camera hanging out to the side where in a wipe-out it would be damaged. I tried on the seat post looking down but you get too much of the legs. I think farther down the frame. Might try behind the down tube in front of the thin tubes going down to the wheel. This could be a nicely protected spot and give a nice shot. One last thought, I learned last weekend that knee pads only protect you if you wear them. I am getting there. In the last few days I installed a 300 mm 25.4mm aluminum seat post to replace the steel 200mm one. The old post was corroded but the key problem was it was too short. Even with it extended beyond the safe limit I was still about two inches short. I believe having the seat at proper height will give better control like it does on a unicycle. The challenge was the new posts were a hair too thick. Between a belt sander and a wire wheel I removed a small amount and the new post fits great. Next was reinstalling a rear hand brake. The brake handle worked even better on the Trek seat than on the original supplied seat. The front slope of the tubes provided a downward slope making for cleaner cable routing. I purchased a basic real caliper side-pull brake. The cable needed to be long enough to accommodate the seat raised to full height. In the pictures it is more in the position for me so there is extra bend. While installing the cable I got to use one of my favorite Park Tools – the BT-5 Adjustable Third Hand Brake Tool. No longer made by Park, it holds the brake closed while the cable is threaded and tightened. To make my next ride more challenging I bought soccer collapsible marker cones. It was an idea I read in a unicycle book. The nice part is if I run over one it just flattens. I also bought a handlebar mount for the GoPro camera so can do shots with the camera attached to the frame. That should give an interesting perspective. I was very encouraged by yesterday’s ride. The tire pressure was low so I pulled the tire/tube but could not find any leaks. I applied two layers of cloth tape to the rim inside to protect the tube from the spoke caps, dusted the tire inside with baby powder and reinflated. I will watch it. I was not happy with the seat height so I need to look for another post. I got an aluminum one but it is snug. I will check the steel/chrome ones. The post is one inch but sold as a 25.4mm. A steel one is easy to find. Next was the seat. I have several saddles at home and found this old Trak one. The hand brake lever mounted nicely and the seat is higher so I am going to try it. As discussed before I went for a coaster brake wheel. I can see the value of the hand brake so I am looking for a new one. The old one is badly corroded. The second interesting part was my new GoPro camera and helmet. I am a firm believer in helmets. I have several for road bikes but the skate bike and unicycle is more like a BMX setup with back falls. I needed something to protect the back of my head in a rear fall. I have been interested in the GoPro and saw this an a nice opportunity to try one. First observation – that is the most amazing adhesive on the mount. That puppy is never coming off. Dorothea also played around with how-to-do the roaming camera capture. Carrying around the camera on the folded up tripod gave some stability to the shot. Laying in the picture-in-picture is a challenge as the GoPro footage does not show real time when you preview in iMovie so I had to work from visual markers. It is a place I can see a clapboard helping to provide sync points. Lots of interesting things to explore. Now I am looking for the brake calipers. That should be interesting. Today I rode the rebuilt skate bike for the first time. The new hard bushings worked well. (Thanks Gord) The added rigidity provided stability. The seat needs to be a bit higher but was extended as far as it could go. Also I would like to try a longer seat to help with control. BUT – I was excited. This was also my first experience with the GoPro camera on my helmet. We were riding in the parking lot of the Sunderland Public School. I got some interesting looks from the locals. Took the skate bike out for it’s first run since the rebuild. The new truck came with very soft bushings. Bushings control how soft/hard the steering is. In the case of a skate bike they also provide some side to side stability. I have an email into Area 51 to query about much firmer bushings. When I checked the old ones out they were very rigid and cranked so tight they hardly turned. All of the new parts are on. Biggest challenge was the seat post and the crank cotters. The aluminum seat post I bought is speced as the same size but it is just a hair wider. I cleaned up the old steel chromed post and will see how it works. If I need the additional length I will work on the aluminum post to thin it or look for an older spec steel post. The crank cotters are also a hair large. I still had the old ones so I refit them. My goal now is to try the bike this evening. It is 33o C (91F) right now. Too hot for me. Once the sun gets on the horizon it will cool down. Once I see how things work I can plan on the frame restoration. Cleaned and polished the skate bike bottom bracket and cranks. From the beginning this was going to be the toughest part to replace. The bottom bracket (BB) is an old British/I.S.O. 1.370″ X 24 tpi threading with a shell width of 68 mm. The size on the spindle is listed as 3S but does not match any I can find. Fortunately the corrosion is not too bad. I wire brushed the parts. The most corrosion is on the locking ring which should not be hard to replace. I am going to mount them and use a grease finish to protect the raw metal. The skate bike will not be exposed to rain so the covering should provide the necessary protection. Exciting day for me as the skateboard parts arrived. The crank cotters came yesterday. One thing that has been bugging me is what to do about the sticker. Obviously they are no longer made. I measured the plate and it is 3 inches in diameter. Then an idea. How about a stick on reflector. While it would be nice to have a proper sticker, my goal is not a vintage restoration but a functioning bike. The reflector will not look out of place. The frame is still rough but I decided to put the new parts on and see how it works before sandblasting and repainting the frame. From my old long distance bike riding days I have a proper Park Mechanic Repair Stand. Once the frame is mounted it is easy to spin the frame to the most convenient position for each job. My first goal was the skateboard trucks. What lovely units and well engineered. The shipment even came with the skater obligatory stickers for the various brands. Thanks Gord. The nice looking trucks cry out for the frame sandblast but they are on. I removed the rusted pedals from the cranks but with the heat wave the garage was just too hot. Enough for one night. There is still a long way to go but I am encouraged. I am hoping to try it out this weekend to see if I need to modify anything before painting. In “Restoring my Skatebike” I described the bike and my plans to restore it. I dismantled the unit and set out to buy replacement parts. Fortunately, most are available off the shelf. My first stop was Bay Cycle and Sports in Pickering. There were two challenges to my visit. The first had to do with the fact that I went when they were having a summer tent sale and it was packed. Thanks to the guys in the repair shop, however, I got the new wheel, tire/tube, chain, pedals and seat post. The wheel has a coaster brake, which several other skate bikes used. I always found reaching under the seat to stop inefficient, and frankly, embarrassing. The hand brake comes off easily, and the lever is held on with two screws, so I could mount it again if I want to. What is a crank cotter? The cranks proved to be a problem. While the bottom bracket (BB) is a standard size, the cranks are very short (100 mm). Removing the cranks was difficult, as the cotters that hold them on were in solid. The cranks and BB proved to be OK except for some surface corrosion. Buying a replacement would be difficult, so I decided to clean them up and reuse them. The crank cotters on the bike were corroded and damaged, but I couldn’t find replacement parts at Bay Cycle Sports. A search of the web led me to Mark Stonich at Bikesmith Design & Fabrication. A set of Grade A cotters is in transit from Minneapolis. Thanks, Mark. On to the skateboard parts. The truck is an old school mount (2.5″ vs 2.125″), and I needed only one truck. Gord at Area 51 provided the answer with a single Tracker RT-X. Gord also gave me advice on other bits, such as the best riser for the situation. I ordered Powell/Peralta Mini Cubic 64 wheels in all black, as they match the black tire and new wheel rim. A friend is giving me access to his sand blasting cabinet to strip the frame. Then I have to figure out how I will paint it. In the mid 1980’s while shopping in Eaton Centre I spotted this SkateBike in Collegiate Sports. It was love at first sight and I bought it. After we moved to the country it got little use as we lived on a dirt road. For years it sat in my barn. Recently I pulled it out and set out to restore it. This video shows the same model. One of the key issues is the seat post is only 200 mm long so unless you were a kid you could not get proper leg extension. Also the brake lever under the seat is a bit weird. Another video of a kid riding same model as mine. Even his seat is too low. Love this video of a competitor to mine. It is so 1980’s. My bike is badly rusted and the tire cracked. I have been collecting up measurements to replace parts. Fortunately most of them are common. As I intend to actually use it I want to replace the wheel with a coaster brake one. The tire is 16×1.75 so finding a coaster brake unit should not pose a problem. A longboard truck will work on the front. The included truck is an old-school mounting with 2.5″ holes front to back. Once I settle on the tire and truck/wheel I can select the appropriate riser thickness. The biggest challenge is the cranks. The old bottom bracket is a common British/ISO unit but the cranks are only 100 mm long. The shortest unit I can find is 115 mm for BMX riding. You can see from the videos there is room for a longer crank and as I recall the short length makes for hard pedaling. This weekend I will investigate the bike parts. I may have to just restore the old BB/crank.